I’d never tried butternut squash before, though it seems to be a staple in local farms judging from the quantities available at my little local market. When we cut it open, it was quite clear how it got its name: it really does smell like buttered, toasted nuts. According to what I’ve read, Aussies will probably know this one as a Butternut Pumpkin, and it can be used as any other winter squash: roast it, mash it, puree it, etc. You could probably even make a butternut pumpkin pie (and that would be delicious!). The skin and stem aren’t edible so peel it before eating and the seeds should be removed (and roasted for snacks!) before cooking. I really enjoyed this soup, but I’m not sure what it needs. Here’s the thing: When we began eating it, it tasted like it was missing something. By the time we finished, it was perfect. I still think it needed a bit more heat and a bit of a longer rest before serving, but I’m not sure. If you make this, stop by and let me know how it turned out. I’d love to know if someone can figure out what it needs to be perfect on the first sip instead of the last. Cut the squash in half, remove seeds, peel and cut into 1″ chunks. In a large pot, heat oil over medium heat. Saute onion, jalapeno and garlic until edges begin to brown, then add carrot and spices. Cook for an additional 2 minutes. Add squash. Pour in white wine and make sure the fond (bits stuck to the bottom of the pan) is scraped up. Add stock and bring to a boil. Reduce to a simmer and cook for 15 – 20 minutes or until everything is tender. 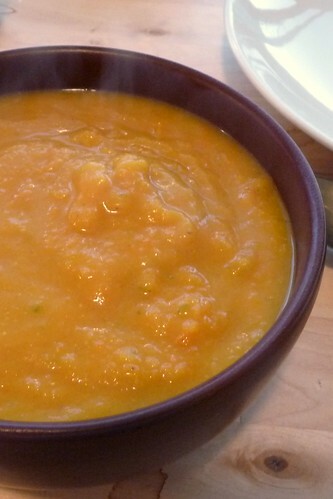 Puree until smooth using an immersion blender or transfer in batches to a blender or food processor. Stir in butter, taste, adjust seasoning as necessary. This entry was posted in dairy-free, gluten-free, soup, untranslated, vegetarian. Bookmark the permalink.